A scenic vertical picture taken of Mt. Rainier from the top of Crystal Mountain in Washington State. 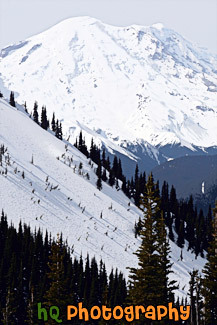 This photo was taken from the Powder Pass Run that leads down to the Lucky Shot from the Rainier Express lift. Mt. Rainier is seen with snow piled on.